Fr. John Britto Antony C.S.C truly believes in God’s hand leading him through his life. 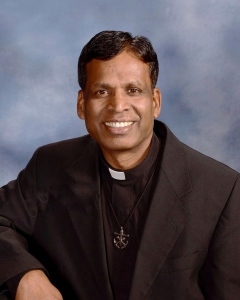 Hailing from India he has been a member of the Congregation of Holy Cross since 1985 and has truly experienced the joy of letting God lead his life for “God does not ration his gift of the Spirit” (John 3:34). Fr. John said that his life has been enriched in inexplicable ways when he began to let God take over his life. He has had varied experiences in Holy Cross such as being a Formator, Teacher, Administrator and now at St. John the Evangelist Catholic Church in Florida doing what he enjoys most: bringing people to God and God to people.